Perfectly placed in the heart of one of the world’s most exciting cities and on the banks of the River Thames, The Savoy is just steps away from the colour and vibrancy of Covent Garden and a short taxi or boat ride to renowned London landmarks or to the ultimate designer shopping destinations of Knightsbridge, Mayfair and Chelsea. Within lies some of the most renowned restaurants and bars in London. Take a seat for a glass of champagne and a bite to eat at the impressive oyster bar in Kaspar’s Seafood Bar and Grill, or enjoy an informal all-day dining menu. Step into the theatrical setting of ourBeaufort Bar where Character Cocktails pay tribute to four of the most famous stars to have resided here at The Savoy or sip a classic drink with a contemporary twist in the world-famous American Bar. The Savoy brings you the very best of Christmas and the New Year. From special festive teas in the Thames Foyer and a luxury dining experience in Kaspar’s Seafood Bar and Grill to a glittering New Year’s Eve party in the Lancaster Ballroom. Furthermore our beautifully appointed rooms and suites, many with river views, provide a stylish setting to enjoy the festive season. The Savoy, where the true spirit of London is celebrated. The Savoy is an iconic hotel brilliantly reinvented for the 21st century, where the glamour of 125-years of history sparkles with a new lustre. We look forward to welcoming you. London is served by five main airports, from the UK's main gateway at London Heathrow to UK’s leading Business Airport London City Airport in the Docklands. London Heathrow Airport (LHR) is approximately 25 miles west of The Savoy. From Heathrow Airport the journey time to The Savoy by Taxi is approximately 60 minutes depending on traffic. Underground service from London Heathrow is available on the Piccadilly Line. The closest Underground station to The Savoy is Covent Garden Station. Travel time is approximately 55 minutes to Covent Garden Station. Express train service from London Heathrow is available on the Heathrow Express. This service is available to Paddington Station. It is recommended to take a taxi from Paddington Station. Travel time is approximately 15 minutes from London Heathrow to Paddington Station. London Gatwick Airport (LGW) is approximately 35 miles south of The Savoy. 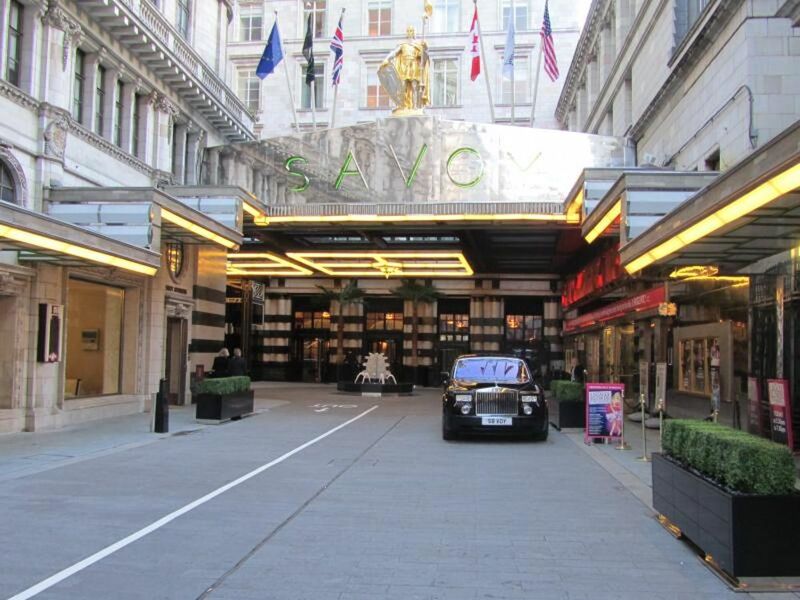 From London Gatwick the journey time to The Savoy by taxi is approximately 90 minutes depending on traffic. There is no Underground service to London Gatwick. Express train service from London Gatwick is available on the Gatwick Express. This service is available to Victoria Station. It is recommended to take a taxi from Victoria Station. Travel time is approximately 35 minutes to Victoria Station from London Gatwick. London City Airport (LCY) is approximately 5 miles east of The Savoy. From London City Airport the journey time by taxi is approximately 40 minutes. London City Airport terminal is directly connected with the Dockland Light Railway (DLR), an overground train system connecting East London to the London Underground network. The closest Jubilee Line Underground station to The Savoy is Waterloo Station. Travel time is approximately 28 minutes from London City Airport to Waterloo Station. London Stansted Airport (STN) is approximately 55 miles northeast of The Savoy. From London Stansted the journey time to The Savoy is approximately 90 minutes by taxi. There is no Underground service to London Stansted. Express train service from London Stansted is available on the Stansted Express. This service is available to Liverpool Street Station. It is recommended to take a taxi from Liverpool Street Station. Travel time is approximately 40 minutes from London Stansted to Liverpool Street Station. London Luton Airport (LTN) is approximately 50 miles north of The Savoy. From Luton Airport the journey time to the Savoy is approximately 60minutes by taxi. There is no Underground service to Luton Airport. Train service from Luton Airport is available to St. Pancras Station, a bus connection is required at the terminus. It is recommended to take a taxi from St. Pancras Station. Travel time is approximately 40 minutes from Luton Airport to St Pancras Station.